If you have just moved to a new house, or just don’t know where to start with the yard, but would love to create an oasis, there are really cool yard art ideas that you can incorporate. The standard backyard when I was a kid was to line the rectangle shape along the fence line with flower beds. Every week my mother would weed them and they would look really nice, but I always thought it didn’t really add personality to the yard, and it took years for the perennials and shrubs to reach maturity to make the yard perfect with that 3D effect. It is really nice to give your space a “3D” effect rather than a long row of perfectly arranged flowers; you could have all kinds of different things in the yard. Almost like an oversized “trinket” shelf, like you might have in your home. I love this idea, as it will take up space, so that you don’t have to plant every square inch, and adds some personality and whimsy. You could even just do some garden art to place between shrubs until they grow and then move it somewhere else. This is moving art at is best! Thrift Store – One really cool idea, that worked for me was to head to the local thrift store, and get chairs that are not in the best shape to sit on, such as basket chairs, and mesh chairs. Take them home and with a basket chair, fill the seat area with garden carpet or mesh and then soil and then some annuals and place in your flower beds as a piece of living art. With a wooden chair, you could simply paint it with outdoor paints, and then sit a basket of flowers or something on the seat, (get the basket from the thrift store too!) and place in your yard between shrubs for example, or even on your front porch. Recycling at its best! Just try and think outside the box when you are in the thrift store. Take a look at items and picture them being retrofitted into something in your garden. You could simply paint a child’s table and chairs and give your garden a 3 D effect. Cut a hole in the table and plant fast growing ornamental grasses that would grow through the hole in the table. There are many ideas. The thrift store is an awesome place to fill your garden with art on the cheap while your other plants are growing, or maybe you rent your space and want to create a portable oasis. 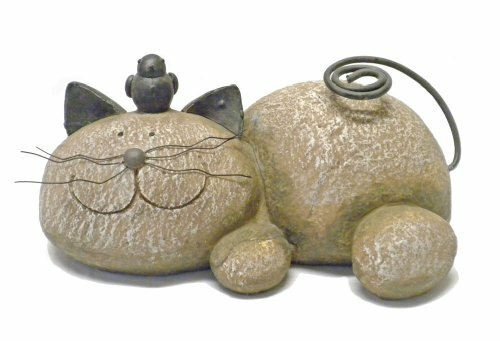 Metal Yard Art – You can create your own works of art, or you can get them online for an affordable price. Something just a little different to have peaking out amongst your tulips or grasses or shrubs, I love these birds and have one myself; they just add character to the yard. You could also check out metal type pieces in your local thrift store, with a coat of outdoor metal paint, you can bring most things back to life. Recycled Yard Art – Really the Thrift store or garage sales are the perfect places to check out garden crafts. Many people who are moving don’t want to bring these things with them, and will sell them off cheap in a garage sale. You could fix up most things to work outside with the right paint. This is recycling, especially if it is something that has seen better days and just about ready for the scrap heap, you can turn it into your own one of a kind yard creation. 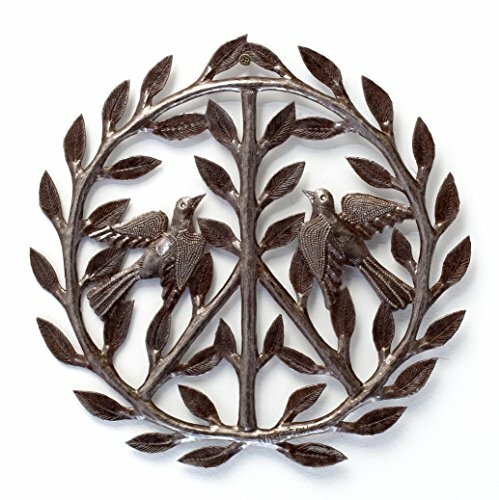 Peace Sign, Haitian Metal, Recycled Outdoor Art, Wall Sculpture 12" x 12"
You can also purchase all kinds of cool recycled metal items online. There are many great artisans out there that can make awesome pieces from old metal drums for example, such as the one pictured. Glass Yard Art – You can put glass pieces such as old vases and mason jars into the garden and turn them into great creations with candles, but with technology getting better and better all the time and also cheaper, there are some great pieces online that are created from glass and are solar, so that they create an awesome ambiance in your garden at night too. I love the glass tulip (pictured), it is solar and is beautiful and would make a great addition if you got a few of them. It is worth shopping online for the variety that you can get. You own local garden centers simply cannot carry the massive line of creations that are available for your yard masterpieces! Upgrade an Ugly Patio – This is something I am planning on doing this season. My own patio stones at this house we just moved into have seen better days. Even after weeding between the stones, it just looks a bit “blah”. But I don’t have the budget to start ripping it up and replacing it with a deck or poured concrete, so I decided on an outdoor area rug. You can get these at many home improvement stores and garden stores, but there is a huge selection online as well, and they are an affordable way to update your space. 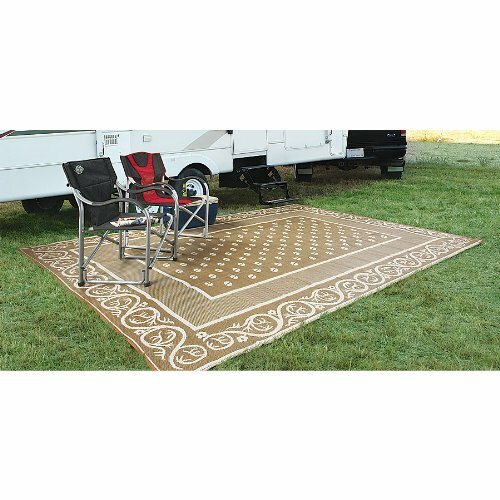 You can put your table and chairs on this rug, it is pretty strong, and it can be hosed down or simply swept with a broom. You can leave it out all season and it dries very fast. Garden Crafts – You should create a budget and then stand in the middle of your yard and figure out which areas could use some whimsy and colour and then create a drawing, or do what I do and when you see something you like, you will work with it. You don’t have to fill every corner with rows of flowers, add something a little different to look at while on your patio and have your very own living art gallery oasis. This article has such cute ideas! I'm just starting out with making a home, but I will definitely remember some of this! I love your ideas. I'm a big yard art person too.